The trim guys have done most of the doors (except for the "plinths" -- blocks that go at intersections between base trim and door trim. The plinths usually go on before the door trim, but due to a miscommunication, the trim was installed all the way to the floor, so they had to cut off the bottoms to make room for the plinths). They have also trimmed out three sides of most of the windows. I think they're still waiting on the thicker sill material. 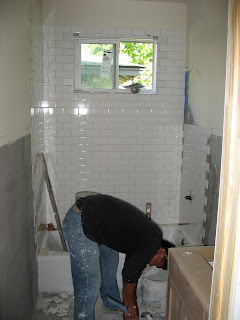 On the tile front, the subway tile in the front bathroom is underway. The tile will not only be in the shower but will also continue around the room as a wainscot to just above the grey part of the walls. If I may be so bold, this was already going to be the prettiest room in the house, and the plumbing/lighting crisis led, indirectly, to some changes that are going to make it even prettier. 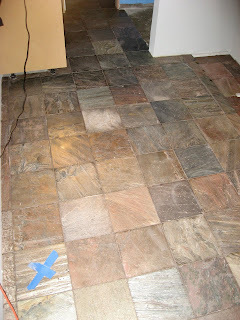 Our tile guy, Arturo, and his crew finished tiling the mudroom floor yesterday and grouted it today. It's a bold tile, and before they installed it, I was a little worried that it would be too much, but I think it looks amazing. 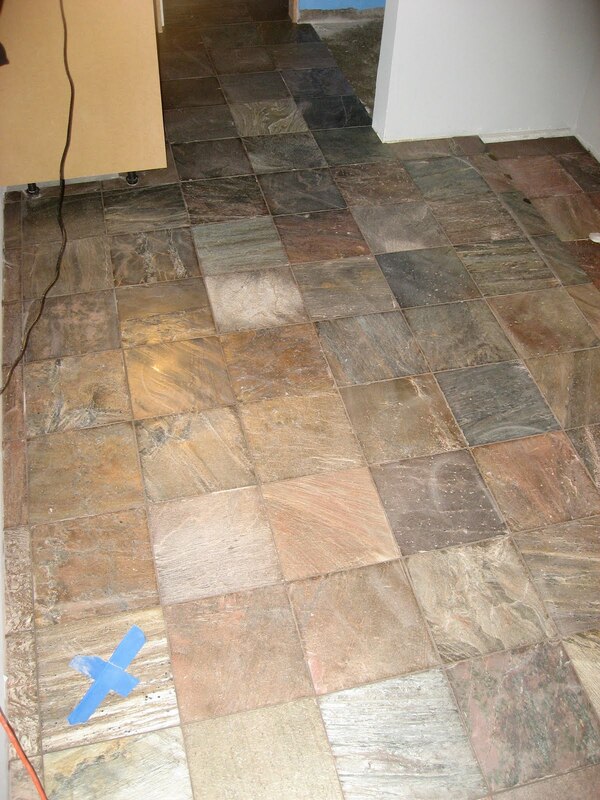 As long as the final paint color (bluish grey) goes with the tile...which remains to be seen. This disgruntled-looking fellow is cutting 12"x12" tiles (the same ones as in the picture of the back bathroom floor from earlier in the week) into 4"x4" tiles to be used (because of the slope) on the floor of the master shower. In the corner of the room, you can see a stack of the tiles he's already cut. (It was about 5:30 p.m. at this point. I guess I'd be disgruntled, too.) The two tall, white boxes on the left side of this picture contain the orange matting that makes up the radiant floor heating system for the master bathroom. Steve was really insistent that the shower floor also be heated -- which seemed excessive to me, but maybe I'll really appreciate it in the middle of winter. In any event, this system should be really nice. It's programmable, like a thermostat, so we can set it to start warming the bathroom floor just before we wake up. Since the bathroom is on a corner of the house, the floor could get pretty cold without it. Cold for Texas, I mean.